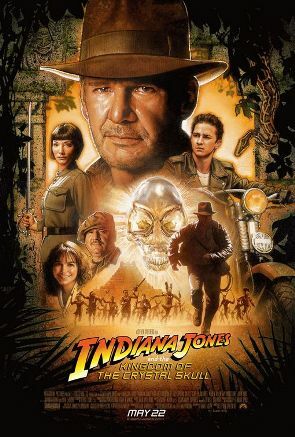 I listened to a recent episode of James Bonding where they talked about Indiana Jones instead (they called the episode 'Indiana Jonesing' which I dug) and that sort of got me interested in going back and revisiting the fourth and most recent Indiana Jones movie: The Kingdom of the Crystal Skull. I remember not really liking it all that much the first time I saw it, but upon second viewing, I am happy to report that despite the weird paranormal bits and the ridiculousness of escaping an atomic blast in a lead lined fridge, it actually was much better than I remember it being. After that, he gets decontaminated and debriefed by the Army and sent back this college where, thanks to the Red Scare, he's put on a leave of absence to keep his job- but the dean of the college (Jim Broadbent) resigns to save Indiana's job. Kind of at a loss, he's approached by a greaser named Mutt Williams (Shia LaBeouf) who tells him that his old friend Harold Oxley (John Hurt) has found a Crystal Skull in Peru and lost his mind as a result and been kidnapped and just like that, Indiana and Mutt are off to Peru! While there, they figure out that the crystal skulls are leading to the mythical city of Akator (also known as El Dorado) and Mutt's mom is none other than Marion Ravenwood (Karen Allen) who has also been kidnapped by Colonel Spalko and her merry Soviet Men. Chases through the jungle, dry sand and giant, flesh eating ants all follow before they get to Akator and find not aliens, but 'interdimensional beings' that, once the skull is returned to it's body, are thankfully they've been reunited and then bug the heck out of there, frying Colonel Spalko and her goons in the process. In the end, it turns out that Mutt is Indiana's son and finally, Indiana settles down and marries Marion at the end of the film. The wind blows his fedora off of the coat rack in the church and Mutt is about to pick it up when Indiana grabs it and puts it on his own head with a grin. He may be married, but he's not done with his adventures yet. Originally, I didn't think the 50s B-Movie thing worked all that well for that movie, but on second viewing, I think I was wrong. As an Indy film, this works just fine for me. The most eye rolling part of the entire thing remains the lead lined fridge, but they get that out of the way early enough on in the movie that it doesn't ruin the rest of it. The return of Marion Ravenwood and having Marion being the one who eventually gets the ring on her finger seems like a perfect happily ever after for the franchise. There is another movie that's allegedly coming in 2020, but if for whatever reason that doesn't happen, Crystal Skull could prove to be a perfectly satisfying ending to the entire franchise. 5 For 2017: How'd I Do? Sportsyball: Tennessee Dumpster Fire Edition!